← Next generation of anatomy apps for learning and patient education here NOW!! Fortunately for athletes, the days of a medic in the bar in a suit are mostly behind us. The general advancement in pre-hospital care and in particular through primary care avenues has led to the recognition that there is “no place for a token Doctor” in the sporting environment. Ethically and medico-legally, pitchside medical staff need to be trained and equipped for the service for which they provide. The exact level to which this training has taken place will vary from sport to sport, with motorsport and equestrian events requiring a level of training comparable to that of general pre-hospital care specialists dealing with immediate medical response to complex polytrauma. However, therein lies the current problem of pre-hospital care teaching and the sporting environment – the injury profiles, or at least those that we know, of most sports are generally not comparable to the case load for which a pre-hospital care specialist would regularly manage. Although sports such as American football, Rugby, Australian rules football and ice hockey have particularly ferocious collisions, they do not cause the patterns of multiple injuries or tissue damage that one would see in a road traffic collision, a fall from a height or a blast injury. Hence, many training courses aimed at tackling standard pre-hospital care scenarios are not entirely appropriate for the pitchside sports physician or physiotherapist. Within pre-hospital emergency care training there exists a niche for a separate entity of sports pre-hospital immediate care courses – courses that reflect not only the injury profiles of the sports for which they are designed, but also the speed of response of the pitchside responder, so that when they meet tachycardia, tachypneoa and distress on the pitch – they have “shock” at the back of their minds, but “recovering from sprinting” at the front. Indeed, the speed of response of pitchside medical staff means that many pre-hospital principals need viewing in a different light. On-field trauma patients don’t really have time to bleed 2 litres of blood into the abdomen by the time they are initially assessed, unlike the patients being assessed by emergency services a few minutes following a car crash. Of course haemorrhagic shock does occur in sport so training needs to include the need to monitor and transfer those about which we are worried. Pelvic haematomas seldom have enough time to form during most sports, let alone be disrupted by particular manoeuvres, so some of the arguments about choice of equipment and techniques when pitchside staff extricate an athlete are more open for debate. Most athletes who compete in an environment with pitchside medical support are extremely fit and with massive physiological reserves – again another unique demographic for the expected caseload and training needs to reflect the physiological response in such individuals to trauma. For some medics at least, every move can be live on TV – with both medical pressures and privacy issues for the athlete, and the pressures of a high media spotlight need also to be taken into consideration. 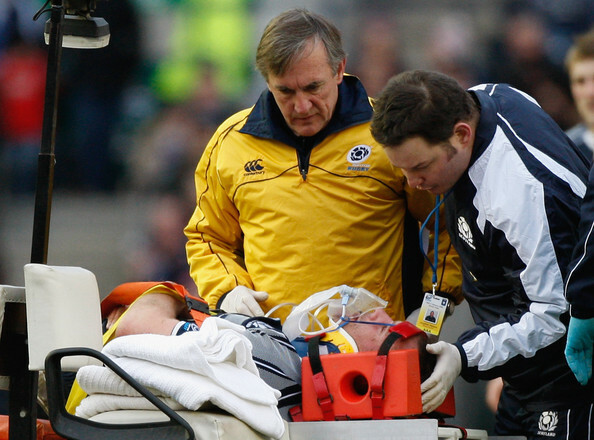 Fortunately the niche of sports pre-hospital immediate care courses has been recognised by the Faculties of Pre-hospital Care and of Sport and Exercise medicine of the Royal College of Surgeons of Edinburgh, and as a result excellent in-hospital courses such as ATLS are being replaced on the sports medicine curriculum by sports pre-hospital immediate care courses. This should lead to regulation about training standards and delivery and help regulate the recent explosion of sports trauma courses to a common standard for the good of the athlete and for the medics. Long may it continue.